Our research focuses on transcriptional and genome replication of respiratory syncytial virus (RSV). RSV is a highly prevalent virus that is the major cause of respiratory tract disease in infants and young children. Its genome structure is closely related to a number of other significant human pathogens, such as measles, mumps and parainfluenza viruses and emerging highly pathogenic viruses, such as Nipah and Ebola viruses. Understanding the molecular mechanisms underlying transcription and genome replication of RSV might help develop antiviral drugs and vaccines to treat and prevent RSV disease, and give insight into how related viruses could also be controlled. 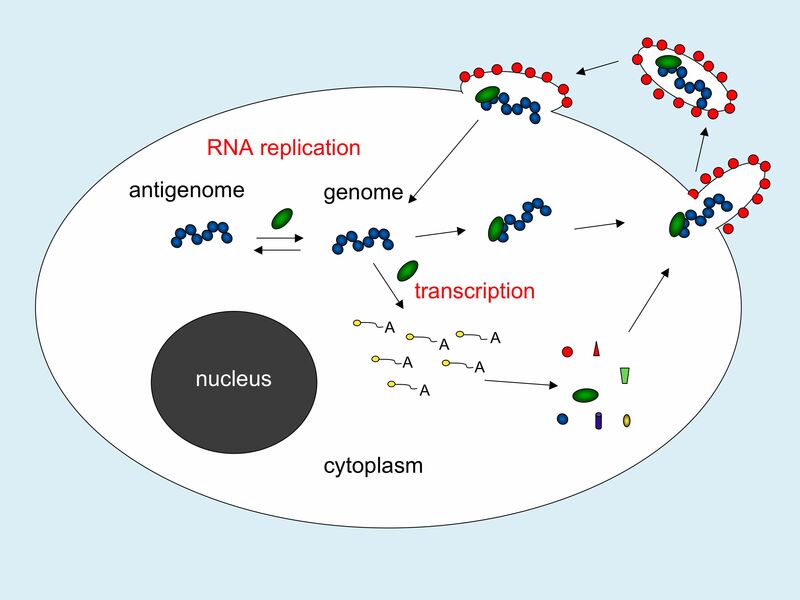 The RSV genome consists of a single strand of negative sense RNA, which is transcribed and replicated by the virus RNA-dependent RNA polymerase in the cytoplasm of the host cell (Fig. 1). Fig. 1: The RSV replication cycle. The virus enters by direct fusion at the plasma membrane, releasing the encapsidated genome RNA (blue) and RNA dependent RNA polymerase (green) into the cytoplasm. 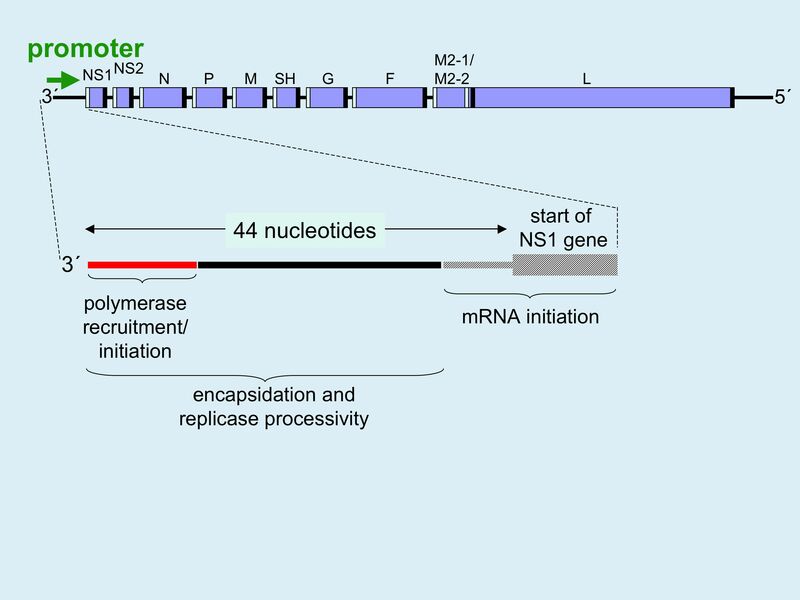 The polymerase uses the genome as a template to produce capped and polyadenylated mRNAs, which are translated into viral proteins, and encapsidated antigenome and genome RNAs. The resulting encapsidated genomes are assembled with other viral proteins and bud from the plasma membrane to produce progeny virus particles. Transcription and replication are quite different processes. Transcription yields ten subgenomic mRNAs, which are capped and polyadenylated. In contrast, replication produces antigenome and genome RNAs, which are full-length and encapsidated with virus nucleoprotein. Transcription and replication are both initiated from a single promoter region at the 3´ end of the genome and it is currently unclear how the polymerase is controlled between these two activities. In previous studies, we characterized this promoter region and identified sequences that signal polymerase recruitment and initiation, encapsidation, and mRNA initiation (Fig. 2). Our current focus is to elucidate the molecular mechanisms by which the polymerase and its associated proteins recognize the genome and interact with these cis-acting signals to initiate either transcription or replication. Fig. 2: Schematic diagram of the RSV genome, with the 3´ promoter region enlarged to illustrate the layout of cis-acting elements involved in transcription and replication. Fig. 3: A possible model for how the polymerase accesses encapsidated RNA. Our data have shown that the polymerase recruitment/initiation sequence must be at or near the end of the template to be functional. This suggests that the polymerase (or another associated protein) first recognizes the 3´ end of the nucleocapsid and then remodels the nucleoprotein molecules at that site to reveal the polymerase binding sequence in the RNA. 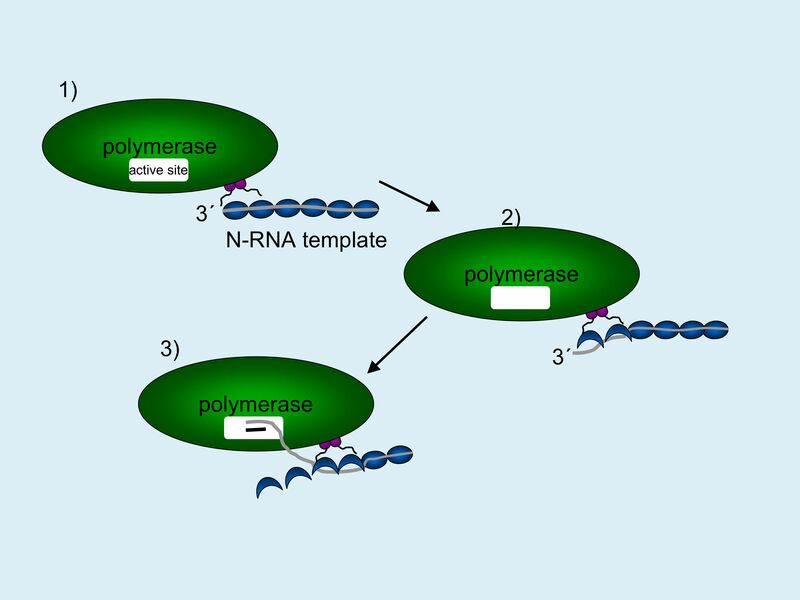 This would allow the polymerase to contact this sequence and initiate RNA synthesis. How does the polymerase access RNA signal sequences within the nucleoprotein-RNA structure (Fig. 3)? How do the cis-acting signals in the promoter region function and which proteins do they interact with? Is the mechanism for RNA strand initiation the same during replicative RNA and mRNA synthesis? What are the components of the polymerase and how is its activity impacted by the cellular environment? Tremaglio CZ, Noton SL, Deflube LR, Fearns R. 2013. The Respiratory syncytial virus polymerase can initiate transcription from position 3 of the leader promoter. J. Virol. 87:3196-3207. PMID: 23283954. Noton SL, Deflubé LR, Tremaglio CZ, Fearns R. 2012. The respiratory syncytial virus polymerase has multiple RNA synthesis activities at the promoter. PLoS Pathogens 8: e1002980. PMID: 23093940. Barr, J.N. and R. Fearns. 2010. How RNA viruses maintain their genome integrity. J. Gen. Virol. 91:1373-1387. Noton, S.L., V.M. Cowton, C.R. Zack, D.R. McGivern and R. Fearns. 2010. Evidence that the polymerase of respiratory syncytial virus initiates RNA replication in a non-templated fashion. Proc. Natl. Acad. Sci. USA 197:10226-10231. Cowton, V.M., D.R. McGivern, and R. Fearns. 2006 Unravelling the complexities of respiratory syncytial virus RNA synthesis. J Gen Virol. 87:1805-1821. Carlos, T.S., R. Fearns, and R.E. Randall. 2005. Interferon-induced alterations in the pattern of parainfluenza virus 5 transcription and protein synthesis and the induction of virus inclusion bodies. J Virol. 79:14112-14121. Cowton, V.M. and R. Fearns. 2005. Evidence that the respiratory syncytial virus polymerase is recruited to nucleotides 1 to 11 at the 3′ end of the nucleocapsid and can scan to access internal signals. J Virol. 79:11311-11322. McGivern, D.R., P.L. Collins, and R. Fearns. 2005. Identification of internal sequences in the 3′ leader region of human respiratory syncytial virus that enhance transcription and confer replication processivity. J Virol. 79:2449-2460. Fearns, R., M.E. Peeples, and P.L. Collins. 2002. Mapping the transcription and replication promoters of respiratory syncytial virus. J Virol. 76:1663-1672. To see additional publications by investigator click on any article and enter last name and initials in Query box.